A heavily-updated version of the Saab 9-3X will be unveiled at CES Asia in Shanghai next week, powered by an electric drivetrain offering a range of up to 186 miles and aimed at the Chinese market. Set to be revealed alongside the showroom-ready version of the 9-3 saloon, it follows Swedish-Japanese-Chinese consortium National Electric Vehicle Sweden (NEVS), which owns most of the assets of bankrupt carmaker Saab, getting a licence to produce vehicles earlier this year. 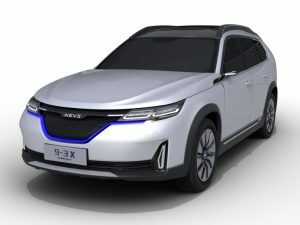 Details are limited at the moment, but the 9-3 is fully electric and offers a 186-mile range, according to NEVS, while the new concepts reflect an updated design incorporating narrower new headlights and reshaped tail lights, as well as a chrome-lined window frame which extends over the top of the front wings. Unlike any Saab-badged versions, the newcomer will feature a WiFi hotspot and offer over-the-air software updates, as well as remote management of battery functions via a smartphone app. It will also include a cabin air filter which is said to dramatically reduce the amount of hazardous particulates occupants are exposed to. Production will take place in China.